“Alexander Nikolayevich Serov was a Russian composer and music critic. He is notable as one of the most important music critics in Russia during the 1850s and 1860s and as the most significant Russian composer of opera in the period between Dargomyzhsky's RUSALKA and the early operas by Cui, Rimsky-Korsakov, Mussorgsky, and Tchaikovsky. In Russia, he became the member of the Petersburg Academy of Sciences. He became a friend of Vladimir Stasov who eventually became a famous art critic. Serov completed his studies in 1840 and started working as a lawyer. Eventually, his interest in music prevailed, and in 1850 he quit his job and began to compose music and to write articles. His was also giving music lectures which were quite popular. In particular, he introduced a variety of music terms into Russian language. Additionally, he first started to use the term ‘simfonizm’ which eventually gained international significance. In 1863, Alexander Serov married his student Valentina Bergman. In 1871, he unexpectedly died of a heart attack. His widow finished his last opera [THE POWER OF THE FIEND] and published his articles. 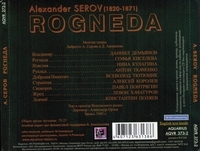 As composer, Serov is notable for composing operas. His first opera, JUDITH, was first performed in 1863. 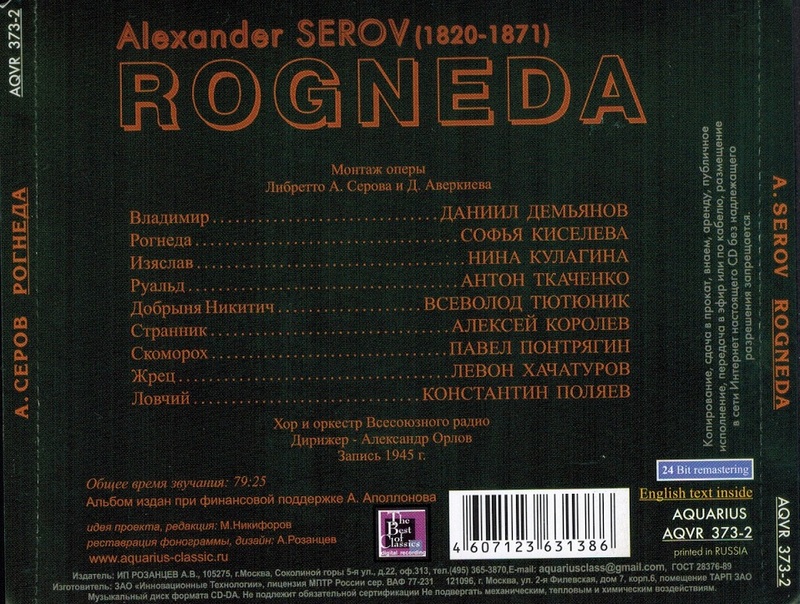 Although Serov's operas JUDITH and ROGNEDA were quite successful at the time, none of his operas is frequently performed today. "As a Russian composer and critic Serov succeeded in being remembered in the annals of musicology for his ascerbic pen and lasting influence on the music of later composers in his homeland. Though his critiques could be taken seriously, perhaps they should not for if Serov was at odds with someone for anything, their music was rapined with a sharpened foil. If he happened to meet a composer, which was a splendid pleasure for him as was the case with both Liszt and Wagner, he could not help but sing their praises loudly and vociferously. Serov had a very narrow opinion when it came to his criticism of composers and often, as described above, weighted his decisions based on personal biases. Though not a prolific composer or even a very talented one, two of Serov's operas have had a lasting impression: JUDITH and ROGNEDA. 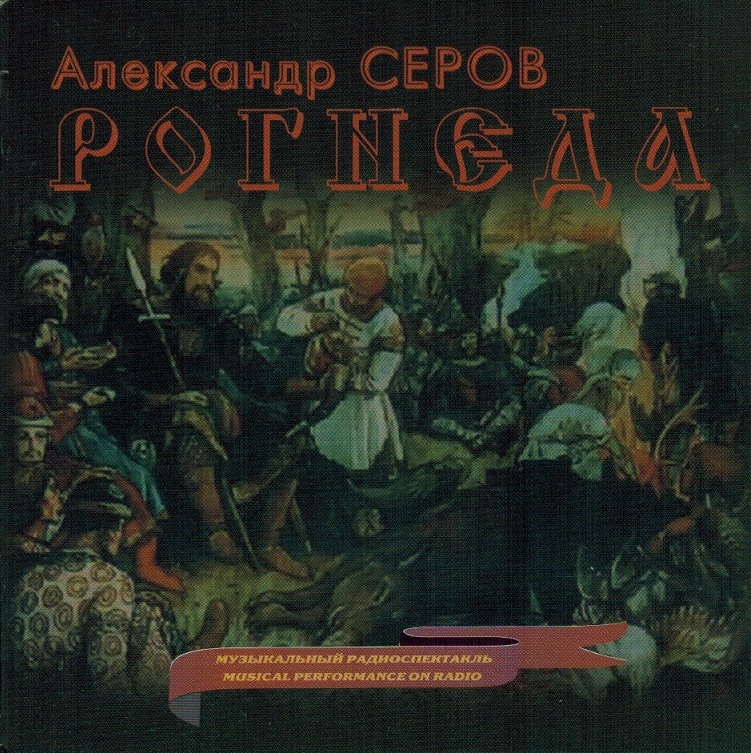 The crowd scenes in JUDITH, which received seventy performances between 1865 and 1870, inspired Mussorgsky's crowd scenes and the Russian folk opera ROGNEDA influenced Mussorgsky through its dramatic import. Dance music within both of the operas influenced Tchaikovsky's ballet music and the folk melodies and textures were imitated if not quoted by Rimsky-Korsakov, Borodin and Balakirev."